I live in Knoxville Tennessee in the United States. My Great-great-great Grandmother was Mary Galway Hinde. Her brother was William Galway. 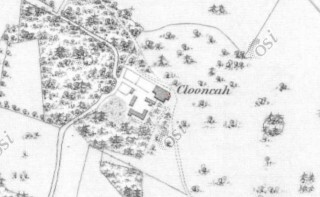 He was the owner on the Clooncah Estate, located west of Woodlawn, at the time of Griffith’s Valuation. William Galway died in 1861. He left the estate in trust for the life of his wife, Harriett. After her death, which occurred in 1883, his will directed that the property be sold and that the proceeds go to Mary’s descendants and other relatives. No acceptable offers were made until Lord Ashtown proposed to purchase the property in the early 1900s. 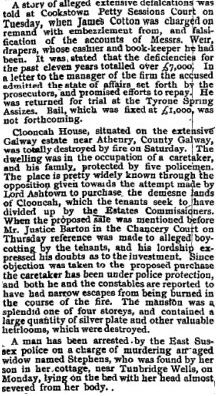 Lord Ashtown’s offer was contested in Ireland’s Superior Court by tenants who thought the property should be divided up by The Estates Commissioners. Kieran Jordan (2000) explained the trustee of the estate was Mr. Villiers of Beech Hill. Wishing to resolve the unsatisfactory situation by selling the farm in its entirety, Villiers applied to the Land Court to set aside the acquisition request issued by the Estates Commissioners under Section 7 of the Land Act 1903. The case came before the court of Mr Justice Ross in May 1905. The mansion at Clooncah Estate was destroyed by fire in December of 1905. A number of newspaper articles report the incident. ‘The mansion was a splendid one of four stories’ the Nenagh News Article reported on 16/12/1905. The Irish Times also refers to the fire spreading ‘rapidly and fiercely’ after the caretaker and his family were rescued. According National University of Ireland, Galway’s Landed Estates Database, stones from the mansion were reported to have been used to build the National School at Attymon. Do you have any historic pictures of the Clooncah mansion/estate or know if any pictures exist? Do you have any additional information about the Galway family or the estate? Any suggestions or information that you can provide would be greatly appreciated. This page was added on 22/11/2016.